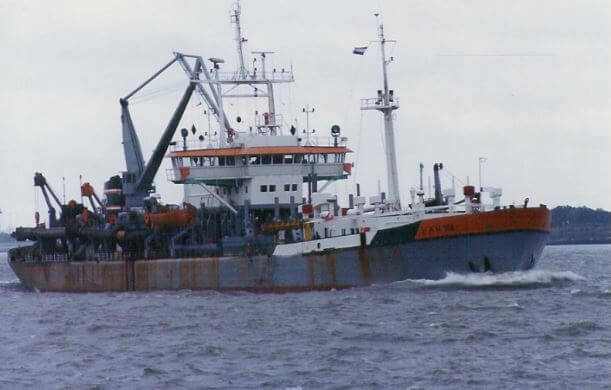 HF: Our piece, Dredging Marine Sand – Container Terminal 6, 1987 article, says that the dredging was undertaken by the Dutch company HAM. HAM has been involved in several Hong Kong projects including Chek Lap Kok airport, Disneyland, Container Terminals 6 + 7, Repulse Bay beach, Lamma Island Power Station, Tsing Yi Island, West Kowloon (Phase One) and the North Lantau Expressway. HAM is “N.V. Hollandsche Aannemings Maatschappij founded in 1909 by dr.Ir. A.C.C.G van Hemert owner of HBM and contractor G.A. van Hattum Dordrecht (later Sliedrecht). G.A. van Hattum was director from 1909-1916. In 1924 all the equipment of van Hattum was sold to H.A.M. Also the German organisation of van Hattum = Norddeutsche Tiefbau Gesellschaft became a part of H.A.M. This article was first posted on 26th June 2016.